Fail to plan and plan to fail. We hear it all time, right? 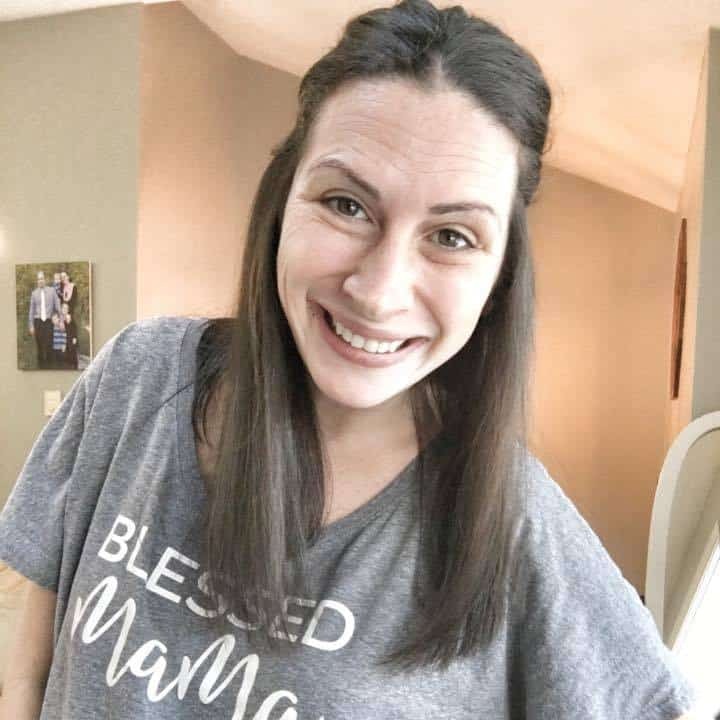 Between work, housework, errands, laundry, and the constant demands of having three small children I somehow wonder how I am able to get anything done. It can be overwhelming to say the least. Healthy eating for busy families doesn’t have to be hard! I have found that having a plan in place for our meals allows me to stay on track with eating healthy without losing my mind! I really do notice such a huge difference in my over all well being on the weeks that I do meal plan and meal prep vs the weeks that I don’t. After a decent amount of trial and error throughout the years I have figured out a pretty good system. I am excited to share my healthy family meal planning tips with you guys! Meal prep is definitely not something that you want to just “wing”. 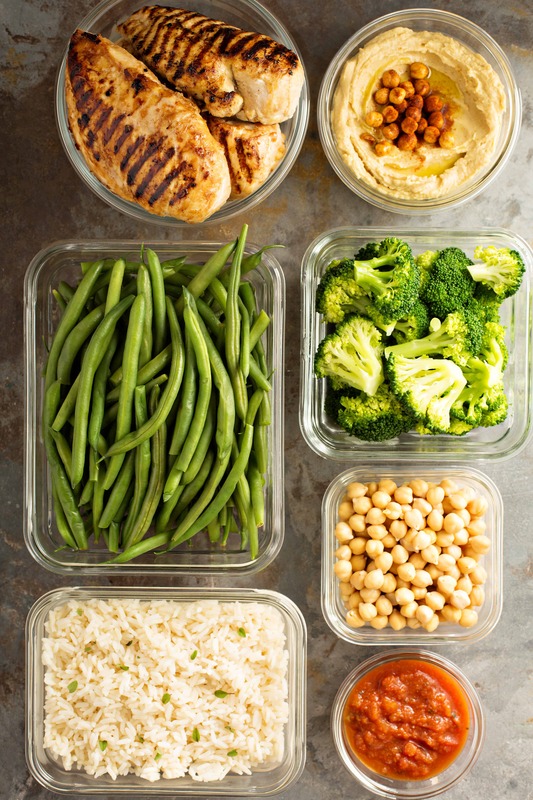 Schedule it into your week – you will need to set aside some time to plan, grocery shop, and do the actual meal prep. This is going to be different for everyone and you will need to figure out when works best for your schedule. I personally like doing my planning and shopping on Friday and do the prep on the weekends. This sets me up for a successful start to the week. Making a plan is one of the most important steps in this process! The first thing I do before creating my weekly meal plan is to check my fridge and pantry for any ingredients that I already have and want to use up. When creating your weekly meal plan I reccomend trying out 1-2 new recipes. Eating the same thing week after week can get boring. I absolutely love trying new recipes however trying ALL new recipes can be overwhelming and more time consuming if you aren’t used to cooking them. For my meal plan I normally choose 5 dinners, 2 breakfast options, 2 snack options, and one lunch option (I often end up having some dinner leftovers for lunch as well). Ok this one goes without saying but since meal prep is all about saving time and simplifying I wanted to share my favorite time saving grocery shopping tip with you…do your grocery shopping from your couch! Yes, you heard me right! 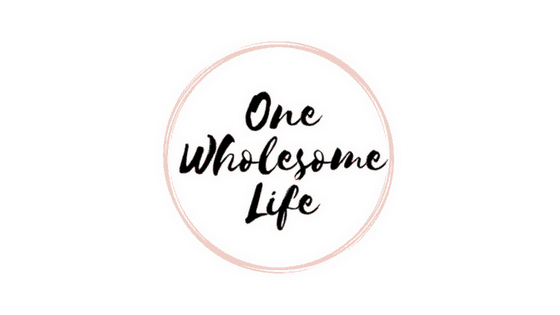 There are so many great shop from home options now! I use and reccomend Walmart Grocery Pick Up. It is totally free as long as you spend $50 and they will bring your groceries right out to your car for you. They have a great app where you can store all of your favorite products and quickly reorder with the click of a button. It’s seriously great! You can use THIS LINK to save $10 off your first order. Another option for all my Amazon lovers is Amazon Fresh and Amazon Pantry. This is perfect if you do not have a local Walmart Grocery Pick Up and is even better because you don’t have to leave the house at all. Score! Amazon actually bought out Whole Foods so Amazon Fresh is the real deal. You can get organic (and non-organic) fruits, veggies, meats, etc. delivered right to your door step. You will need to check if they are in your area. If they are I am super jealous because they are not in mine. Click HERE to find out if they are in your area and to start your free trial. Prime Pantry is in every area and you easily sign up to have your pantry items (think household items, cereal, snacks, vitamins, etc.) delivered on auto-pilot. You can get a free 30 day trial HERE and it is $4.99 per month after that. Having all the right containers ahead of time will make this process SO much easier! 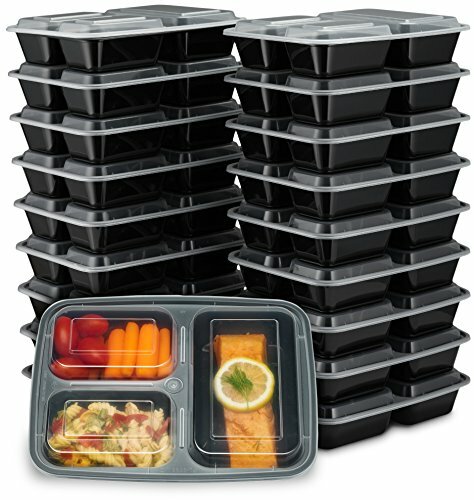 There are SO many great options for meal prep containers out there. 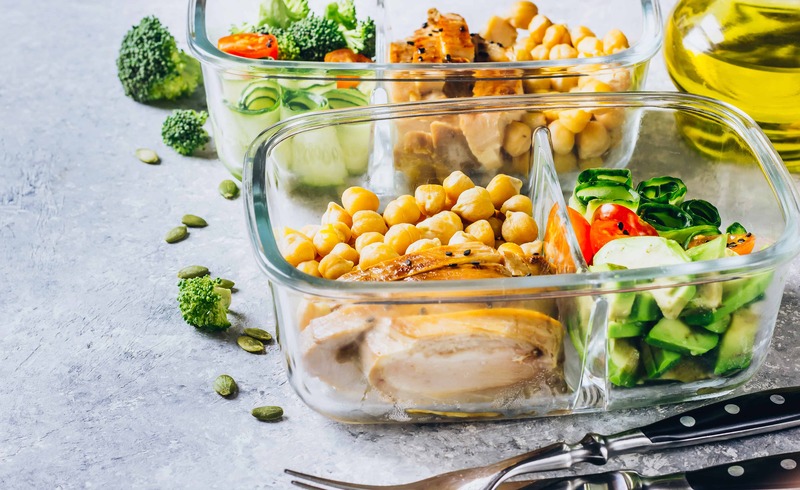 If you prepping for lunch on the go THESE meal prep containers are perfect. They are super light weight and easy for grab and go. 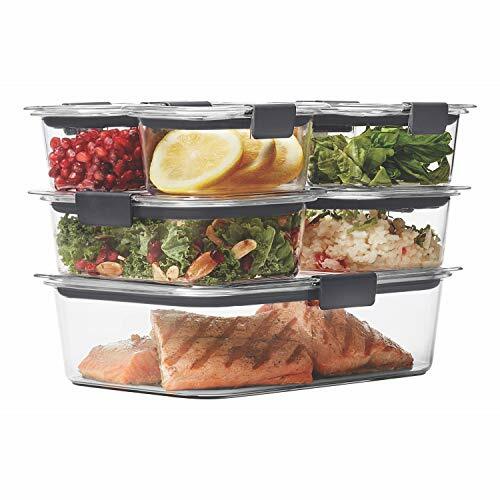 THESE air tight containers from Rubbermaid are a great option for storing chopped up fruits and veggies because the air tight seal makes them last longer. 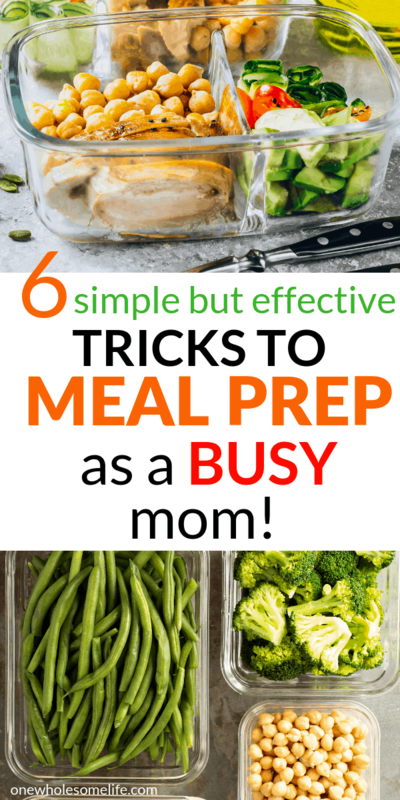 If you are as busy as me you are going to want to keep the actual meal prep part as simple as possible. I normally choose to meal prep two snacks which usually involves chopping some fruits and veggies, hard boiling eggs, and making some type of energy ball such as these DOUBLE CHOCOLATE PROTEIN BALLS. For breakfast options I will sometimes do a make ahead egg bake such as THIS ONE or some overnight oats. I do skip breakfast sometimes when I follow an intermittent fasting schedule. For lunches I will precook some chicken for salads or burrito bowls. Sometimes I will make buffalo pulled chicken or a healthy casserole. As a busy work from home mom having lunches prepped ahead of time is crazy helpful. I don’t go too crazy on meal prep for dinner. If I worked outside of the home and only had a short time to prep dinner I may do more. I love using my Insta Pot to cook diner and I will sometimes prep the meat and/or veggies ahead of time so that I can quickly throw it in. When making dinner double your portions so you can freeze some for another night. Example: Make two pounds of taco meat if your family normally eats one. Wait for your food to cool before storing because it can get soggy. And nobody likes soggy food. Store all those beautifully prepped fruits and veggies in your fridge at eye level so you will be more likely to grab for them when you are hungry. No hiding them in the back! Keep a running list of things that you run out off that you always keep on hand. It is so much easier then trying to remember everything when you are writing up your weekly grocery list. Keeping a magnetic notepad on the fridge is great for this.